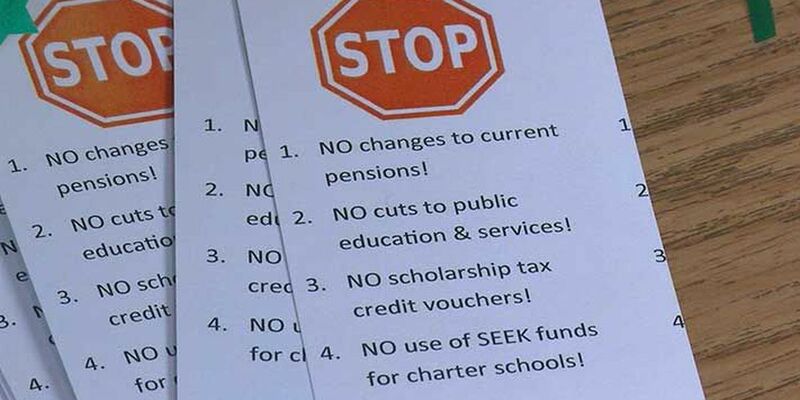 FRANKFORT, KY (WAVE) - An advocacy group for public schools formed a plan to stand up for educators in the least disruptive way to school schedules. Motivated by the decisions made in the Kentucky General Assembly's 2017 legislative session, Gay Adelmann co-founded Save Our Schools Kentucky about a year ago. In 2018, the group is protesting school vouchers, the funding of charter schools, and how educators are affected by pension overhaul. In late 2017 Governor Bevin revealed a pension plan that moved most new state workers to a 401k style plan. Pensions for current employees would be frozen once they hit 27 years of service. After that, they would also move to a 401k style plan. "I don't mind paying taxes for public school because I want to live in a society that values public education," Adelmann said. "Teachers can't come and attend session as easy as a self-employed person as myself can. That is why we thought of the 3-4-5 plan." Adelmann is organizing a method she hopes will be less disruptive to school schedules. She is asking schools to send anywhere between 3 to 5 representatives twice a week to the Capitol Annex in Frankfort. Save Our Schools Kentucky will gather the rest of the support. Together the group plans to make their presence known to those making decisions that affect public schools. "The teachers appreciate the strong support for our public schools demonstrated by the parents and other community stakeholders," Jefferson County Teachers Association President Brent McKim told us. Adelmann says pension reform is a big issue and they want their suggestions heard by legislatures. "The mantra we are promoting is 'Find funding first,'" she said. "Because there are so many revenues generating opportunities that we could be exploring instead of cutting the funding to the pensions." The advocates with Save Our Schools Kentucky will be meeting in the basement of the Capital Annex every Tuesday and Thursday of the 2018 spring session.